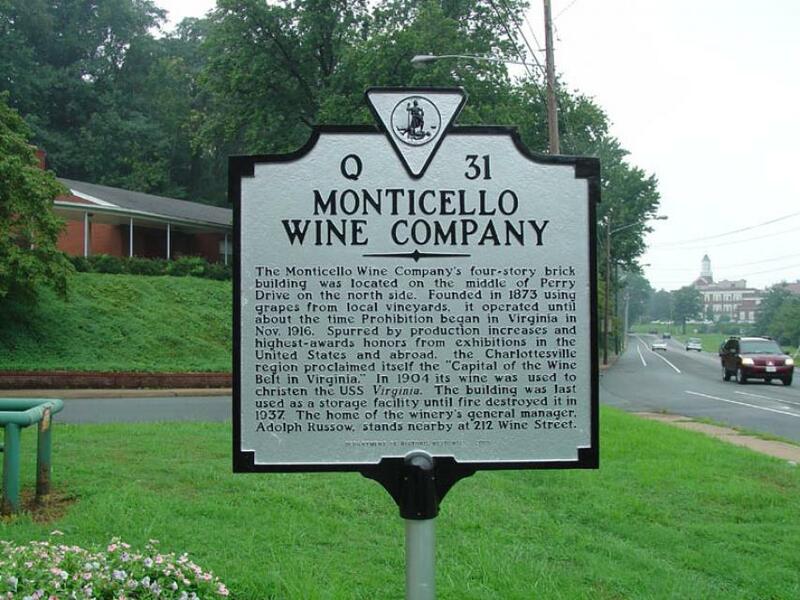 The Monticello Wine Company's four-story brick building was located on the middle of Perry Drive on the north side. Founded in 1873 using grapes from local vineyards, it operated until about the time Prohibition began in Virginia in Nov. 1916. Spurred by production increases and highest-awards honors from exhibitions in the United States and abroad, the Charlottesville region proclaimed itself the "Capital of the Wine Belt in Virginia." In 1904 its wine was used to christen the USS Virginia. The building was last used as a storage facility until fire destroyed it in 1937 The home of the winery's general manager, Adolph Russow, stands nearby at 212 Wine Street. Triumph of "The Charlottesville Twelve"
This marker can also be identified by its HM code. You can use the hashtag #HMBSD in tweets, and any other place where you might refer to this marker, including when searching on this site.